The Olympics start tonight and one bird that will not be taking part is the Ostrich. The ostrich however is a record holder in a number of disciplines which includes the land speed record for a bird. Not only can the ostrich run at speeds of up to 72 kph it can do so for for periods of 15 to 20 minutes and in that time cover 18 to 20 kilometres. Just imagine this bird in the marathon, if it could keep up the pace it would do it in just over half an hour. In days of old the ostrich could be found in Asia and Africa but due to hunting the Asian population was wiped out. Today there is only one species of ostrich left in the world and it is the “ Struthio camelus”. It is a bird that weighs about 130 kgs and stands about two metres tall and cannot fly. It's body is just too big for that. Ostrich farming began in Oudtshoorn way back in the 1900's when there was a demand in Europe for ostrich feathers. Ostriches were first hunted for their feathers but once farming began it was found that an ostrich could be plucked every nine months from its third to its twelfth year of life. This turned out to be very lucrative and many ostrich farmers in the Oudtshoorn area became extremely rich. Many of the old ostrich farms are still there and have been turned into tourist attractions where one can ride an ostrich and see them in their natural state. The male ostrich normally has a harem of about 6 females and mates with them for life. The male has a couple of rituals it goes through before it mates with a female. It starts by sitting on its hacks and waving its wings about while throwing is head from side to side. While doing this it makes a deep thumping sound and also emits a loud booming noise. The female if receptive to the males advances will walk with her head down and make a clucking noise while shaking her wings about . This is the sign for the male to advance. When he does so the female sits down and allows the male to mate with her. Once the male has mated with his harem he builds a nest and each of the females with whom he has mated lays her eggs in the nest. The dominant female then sits on the eggs during the day. There could be as many as 60 eggs in the nest. The males and females are easily recognisable once they are mature as the male is black and white and the female a dull brown colour. As ostriches thrive in desert type regions the female's colour blends in nicely with her surroundings during the day hiding her from possible enemies. At night the male sits on the eggs so that the female can feed. Ostrich eggs are large and very strong. A person can quite easily stand on the egg without breaking the shell. An ostrich egg weighs in the region of 1.5 kgs and is the equivalent of 24 hens eggs. You would have to do some eating to finish one of them for breakfast. Some other interesting facts about ostriches. The eye of an ostrich is bigger than its brain and its cornea is interchangeable with that of a human. 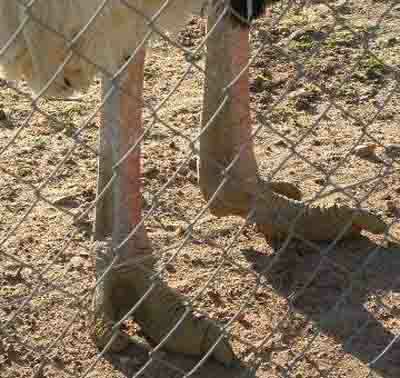 The knees of an ostrich bend backward and it can be extremely dangerous when it is cornered. Its feet have three large toes and if it were to kick you it could tear your stomach open with a single stroke. Ostriches are often used as watch dogs on sheep farms as they chase away anything entering their pens. Nobody in their right minds would pick a fight with one of them as there is no way that you can outrun them if they were to chase you. There is however a way to keep them at bay and that is to go into their pens with a large thorn tree branch. The ostriches appear to respect the thorn bush and will not come closer. Around Cape Town are a number of ostrich farms, one near Cape Point and another on the N7 highway on the way to Malmesbury. 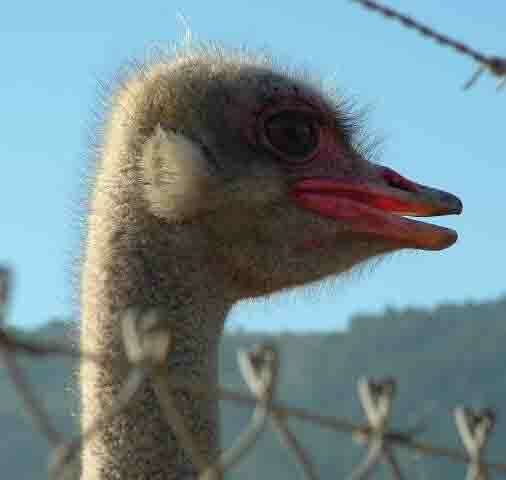 Visitors to Cape Town can visit these farms to see the ostriches. Unfortunately the ostrich is under attack here in SA at the moment. 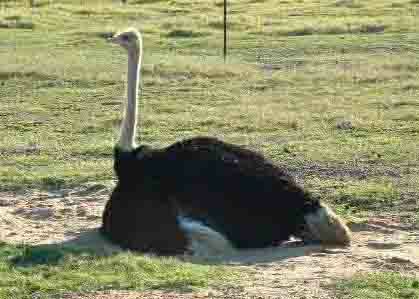 A strain of avian bird flu has hit the Eastern Cape and thousands of ostriches have died. To curb the spread of the flu more than 30000 ostriches have been culled and the movements of ostriches between regions has been stopped until the flu has been eradicated. This of course has dire consequences for ostrich farmers as the export of ostrich meat to the rest of the world has been put on hold resulting in losses of millions of rand. Fortunately for those farmers who are culling their ostriches the government has agreed to refund them for their losses.